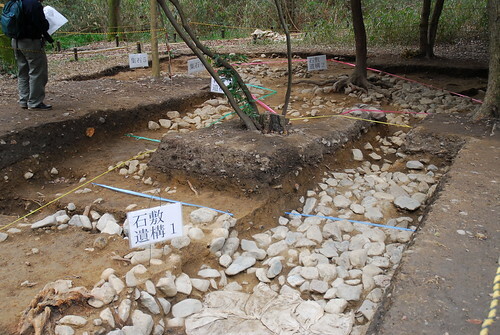 Once upon a time I wanted to excavate Yayoi era sites in Japan. Strange, but true. I still check out photos from sites in Japan on occasion and I find all the multicolored flagging tape and paint on the ground completely baffling. Are they recreating the building? Marking sections? Does anyone know? I’m wondering if they aren’t making site boundaries in pictures 2 and 4, features and excavation trenches so that they show up better in picture 3, and unit boundaries in picture 1? 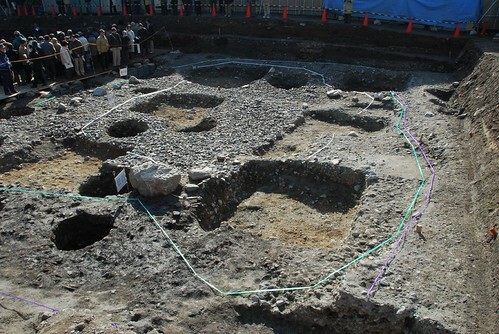 Hi, I’m a first year archaeology grad student in Kyoto, so maybe I can shed some light on this. Pictures 1, 2, and 4 are from open site days, when the public is invited to come see the site and hear explanations from the excavators. The tape and signs are to help explain the features to the public, and aren’t there to guide the excavators or anything like that. I can’t make out the signs in the background, but the sign in the foreground of picture 1 just says “stone pavement feature 1.” I’m not sure what the different color tapes denote, but if I had to hazard a guess, it would be to show the boundaries of the various overlapping features. 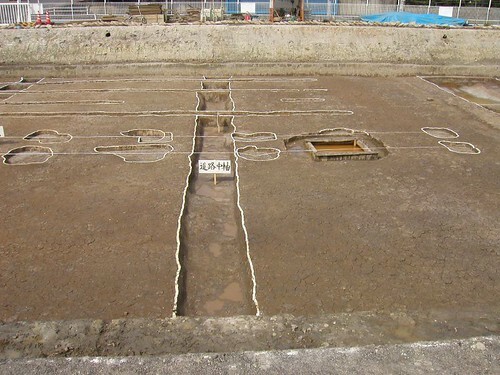 In picture 2, the tape is being used to show which excavated post holes belong to which building, and the signs say what the various features are (dwelling, etc). Picture 3 is probably from an open site day, too, but the paint is also used to outline features prior to photography. It would be pretty difficult to discern many of the features in the final site report’s monochrome photos if the outlines weren’t painted, so this has been the convention here at least since the 50s. Anyway, the sign says that it is the central axis of a road. Thanks for commenting and translating! I think it is great that they do this for open days, especially if the archaeologist isn’t there to explain. 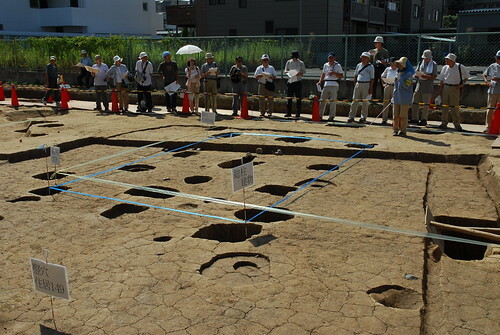 My sample of photos from Japanese excavations is obviously biased, as they were primarily taken from these open days. Still, some of it makes my head hurt a bit, especially as they seem to have left in features from multiple phases in the first photograph, with a downright American penchant for sectioning and pedestalling things. I suppose those square holes in the pond are sondages? Or earlier, pre-pond cuts? I don’t really have enough experience to be much of a judge beyond what I’ve already said, but I did ask one of the senior students specializing in medieval (Japanese) archaeology about the pond. She thought they were pretty mysterious, too, but thought they might be to check the extent of disturbance in the soil. 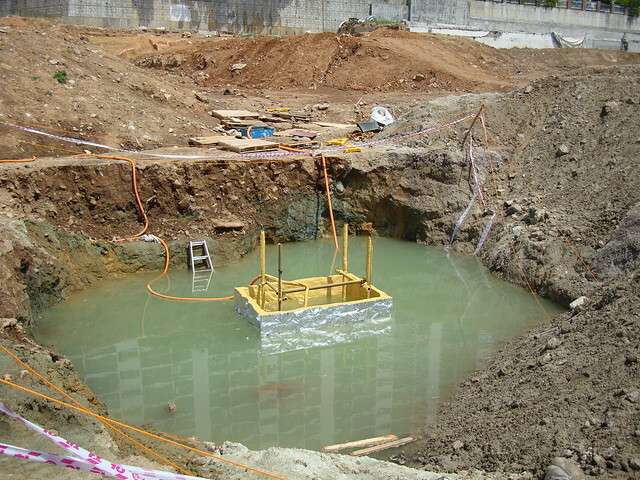 Seems like that’s as far as we can know without finding the actual excavator.